How to choose what towing company to call? ​Towing trucks have their particular uses and benefits. It is important to know which type of truck suits your need so that you won’t end up wasting time and money calling the wrong towing company. 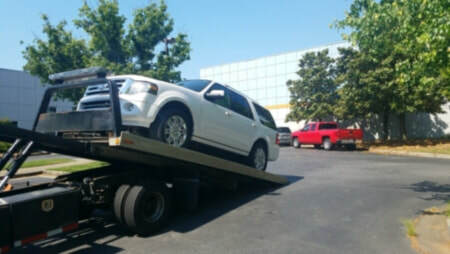 Having a car break down is never fun, but, when it happens you need to be prepared to answer lots of questions in order for the tow company to determine which tow truck they need to send out to help you. What type of car you have? Towing trucks have a limit when it comes to the weight they can carry. What is the condition of your vehicle? How damaged is it? ​If your car is overly damaged and you want it transported to a junkyard, you can call a company that has a hook and chain tow truck. These are not recommended for towing except severely damaged and junk vehicles as they can cause additional damage to the car they are transporting. They are only recommended if additional damage would not matter just because they are a cheaper way to get cars to the junkyard. Is your vehicle 2 wheel drive or 4 wheel drive? ​ If your car is in a ditch, or a place where a flatbed tow truck would not have access, another option would be calling a wheel- lift tow truck. They have a metal yoke that can be hooked under the rear or front wheels, lift the car up from the ground and then pull it out from the ditch. For transporting the car longer distances the driver has to lift the front wheels if the vehicle is front wheel drive and the back wheels if its rear wheel drive. The car is pulled around on 2 wheels to the destination. If the vehicle has a flat tire on one of these wheels, it’s not the best idea to use this type of towing trucks. If your vehicle is a 4 drive wheel, do not use a wheel lift tow truck for any type of emergencies as they can damage the drivetrain. These trucks are a cheaper option to flatbed tow trucks for this job, but not as safe. Is your vehicle low profile vehicle? ​ The most common truck used by towing companies is the flatbed towing truck called also rollback truck. They are easy to use. The car can be driven up the ramp if it’s drivable or pulled up with a winch. They are used for almost any towing situation. They can safely transport any damaged vehicles or a vehicle that has no spare tire on hand. Flatbed towing trucks are one of the safest ways to transport any type of vehicle or motorcycle and can usually tow up to 8.000 lbs. If your vehicle is oversized you might need a more specialized tow truck. These are called integrated tow trucks. They can tow big heavy duty trucks, buses, and construction equipment. Most towing trucks you see running around are flatbed towing trucks. They are able to perform light and medium duty towing jobs that include passenger cars, small trucks or small vans.